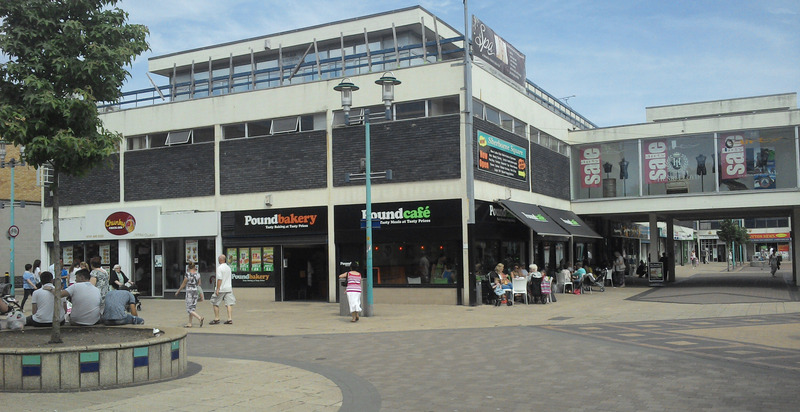 The Pound Cafe in Huyton Village, Merseyside, is attached to the Pound Bakery. As it says on the tin, everything is £1 (or under)! Whilst walking through the village, my son and I were on our way back to the car when he said “I want dinner…”. I was only going to nip in to the bakery, but I thought, ‘why not. It’s the same price, and we get to have a little sit down too’. On entering the Pound Cafe, it was clean, bright, and there were plenty of seats, tables and booths available. That’s not to say that the place was empty… There were about 30 or so people in there, all with full cups and half empty plates in front of them. They all seemed to be enjoying themselves. I approached an empty booth (in bright green! ), and sat my 2 year old down with his new inflatable “Spongebob” toy. I told him to stay there, to mind the table, and I would go and order for us. I went to the fridge area first, and picked up a can of 7up. It was warm. I checked the other cans and bottles in the refrigeration unit, and they were all the same. I dread to think what the sandwiches and cakes were like in there… I let this go though, as temperatures outside were 26C. Incredibly warm. The lady behind the counter greeted me with a “what can I get you?”. No smile, no eye contact, just a gruff voice. I ordered a child’s sausage roll, chips and beans for William, and a jumbo sausage roll for myself. 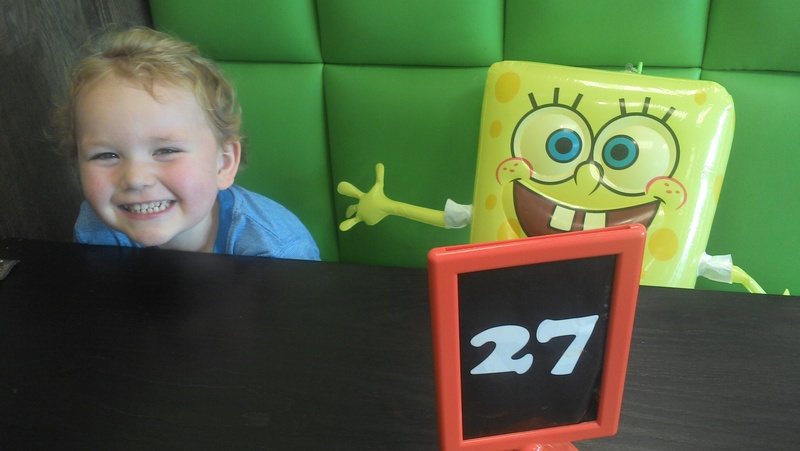 I then paid the £2.80 for my order, and I was handed a number sign to place on the table, so the cafe assistant knew where to bring our food to. The sign was bright orange, with a black laminated piece of paper attached, with a large ’27’ in white. The sign stand was dirty and greasy. It looked like they hadn’t bothered to give it a wipe in months. Wanting to get back, I just grabbed the top of the sign, and returned to my waiting boy. A further 10 minutes, and we finally had our plates put down in front of us. My jumbo sausage roll was delicious. The pastry was flaky, and the sausage meat was well cooked. All together, I would certainly give it a 10 out of 10. My sons, however, did not look as appetising. He had a plate with a cut-off (not even half) a jumbo sausage roll (the menu stated it would be a full, ‘standard’ sausage roll), a big spoonful of baked beans (that looked like plastic), and the chips were anemic and hard. That wasn’t the worst part, to be honest. I wasn’t bothered about the chips, as William had said that he wanted the sausage roll and beans. Now, if you were a server in a cafe / restaurant, would you serve a child’s meal on a hot plate? No? Neither would I. These, however, did. The plate was so hot that even I couldn’t touch it. Back to the food… William had one fork full of beans, and responded with “I don’t like them. They’re cold.” I tasted them, and I agreed. He then had a bite of the sausage roll… Soggy pastry, and cold meat. Work that out. Hot plate, cold food. I didn’t bother saying anything. Even if I did try to speak up, the staff seemed as if they weren’t bothered. One particular woman who worked there, was busy standing outside (near enough in the doorway!! ), smoking a cigarette, and talking to a customer. She shouted back in to the shop, to a customer, “be with you in a minute, love”. I think that I will be sticking to the bakery in the future.